First Weber welcomes Pete Weyenberg to our new Neenah office. Pete and Cindy Weyenberg have happily called Neenah, Wisconsin home their whole lives. Whether it’s hammering nails with Habitat for Humanity, working with Neenah Rotary, serving on several committees with RANW, or Boys’ and Girls’ Brigade, Pete is actively involved in the community. He has served as President of both Neenah Rotary (2010-2011) and Greater Fox Cities Area Habitat for Humanity. Currently Pete is serving on the Board of Directors for Boys’ and Girls’ Brigade, Town of Neenah Board, Town of Neenah Park and Rec Committee and involved with the REALTORS Association of Northeast Wisconsin, Wisconsin REALTORS Association and the National Association of REALTORS. 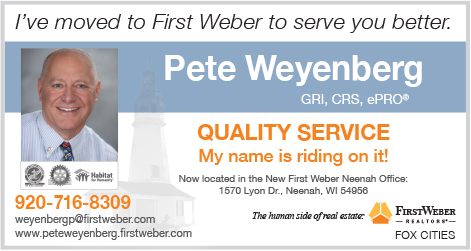 We’re thrilled to have Pete on the First Weber team in Neenah. First Weber can help with that. We offer several online options enabling you to obtain your Wisconsin real estate license at your own pace. See more at First Weber’s Career site. We make getting your Wisconsin real estate license easy. First Weber Foundation sponsor Big Top Parade in July.